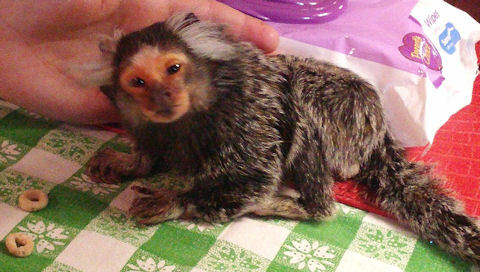 This is the first posting of our “Special Topics” here at Primate Care. I was drawn to write about this topic due to the fact that I am now living with three older monkeys of my own. One of them is a soon to be twenty year old Common Marmoset, and I have a thirty-three year old Black-Cap Capuchin and then the oldest monkey in my troop is a Paraguayan Capuchin that is around forty-three. 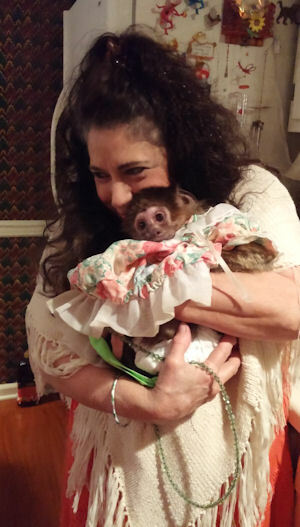 Much of my experience for the past 27 years has been with receiving monkeys who have been younger monkeys. 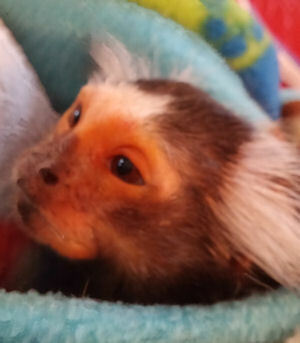 As I look at my little marmoset boy named Chewie which is short for Chewebacca, I find it is hard to imagine that he once used to run and jump all over his cage or how he loved to jump everywhere and hide in my house. I have so many memories of him, especially enjoying raising his bushy tail up to moon all of the people who were going in and out of my home. Chewie has aged into a very grumpy little guy who seems to address his owner (me the mommy) with most of his complaining. Yes, he has grown into being my number one “fuss bucket boy monkey!” He still enjoys to eat and he, of course, loves to share some of my yummy almond milk and cereal but so many of the things that he used to love to do are behind him now. As I am typing these word on the computer, my heart is hurting as I let the memories flow across my mind. His hammock under the warm light was his most favorite place in his world but now I must place him in that special place if he is to spend some time there. His movements are slow and his hearing and eyes do not work well at all. I often awaken him to eat and show him where his food is being placed in his cage due to his failing senses. I truly feel the reason that he is still with us is that he loves his troop. He knows that he is part of our troop and that he is the grandaddy of them all. I am sure he knows too that a piece of my heart will be missing forever when he finally passes over. During the times that Chewie has been extremely ill in the last four years, I have thought that I might truly have to say goodbye to him but something each time has kept me very peaceful during these illness times. I was the best caregiver that I knew how to be to him but each of these times I chose to say to him, “No, Chewie, it is not time yet.” Believe it or not, I knew he just needed a little emotional energy change. In these posting and in my “Living With Monkeys” book I have repeatedly said that I just can’t say it with the proper amount of emphasis that monkeys are extremely emotional. Well, at least where little Chewie is concerned, this has turned out to be beyond true for him. The first time that Chewie became ill I remember being very calm and watching him night and day with great attention being given to every detail of his care. I knew with his age and the fragility of his breed that I had to do everything that I could to turn things around for him. The medicine that the vet had given to Chewie was very harsh on his little system but because of the bug that was attacking his little body the vet suggested to leave him on it for seven days. After five days I knew that I had to talk to the vet about how he was responding to the medicine. We both agreed that we did not need to give him the last four doses of his medicine. I could actually feel Chewie becoming very depressed and he seemed to be giving up his will to live that afternoon that I chose to speak with his vet. I held him close so that I could not only talk to him with words but I also was showing him mind pictures as I talked to him. I tried to give him a colorful pep talk and let him know that there was not going to be anymore of that terrible medicine. It appeared to me that his little eyes were losing their sparkle and his unusual little orange face was pale. I knew without a doubt that Chewie was losing his will to live. On this same day I was having my helper Brandon come to help me with several projects. He had limited time to come to the house to help, so since Chewie was showing such terrible signs of his illness turning towards the worst, I chose to go in and out to check on him all that afternoon as Brandon and I worked together on our projects. Since it was getting close to dark Brandon called his mother and found out that she had to stay late for work and he asked me if I would take him home. We gathered our tools up and I quickly rushed into the house to check once again on Chewie. When I was ready to walk out, I went over and gave Brandon his payment for helping me and then gave him a big hug. Chewie suddenly came alive like his old self and started to become very jealous and started his clicking sound which is always the sound that he makes if someone hugs me or I choose to hug someone. He had always been especially jealous of Brandon, and I remember being very thankful that he was in his cage. Seeing Chewie respond to our hug gave me the idea that maybe an energy change might just be the thing that he needed. I gave Brandon the keys and told him that I would be out in just a few moments. Quickly, I turned around and gathered my personal things and then walked over to check on Chewie before I left. He was not feeling good but a miraculous thing happened when we slid into the seat and he saw Brandon in the seat right next to me. Chewie began strutting around on his side of the car giving Brandon a very rough time with lots of his clicking sounds. I made sure Chewie was a safe distance away from him before I asked him to reach over and touch me. He did what I asked and then an absolute miracle happened. Chewie was giving Brandon the big evil eye look while he was clicking his little head off. He started running up and down my arm with such sounds of complaining. I was totally shocked at what I was seeing. 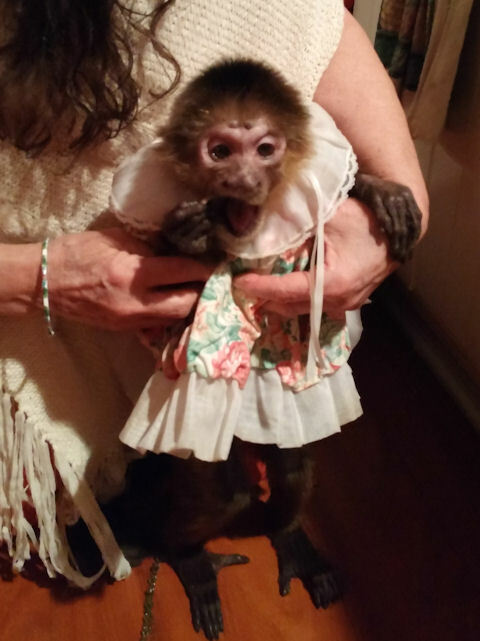 Chewie was a healed monkey! By following my gut instincts I knew that the medicine was making him feel so badly that he just wanted to give up. I had chosen to follow all of the directions that the vet had given to me, but being able to read the energy of my little guy made me call the vet. That day I used all of my tools to look and get into the mind of my little man. Little did I know that my actions and extreme feelings about leaving him at the house set in place the perfect time for little Chewie to receive a miracle. I know that being able to change the energy around a monkey when needed is a very important thing to do when something negative is happening with them but I absolutely did not know that changing the energy around a monkey could literally turn his pathway around. I am sure you must know the trip for Chewie and Brandon was an very important trip. Chewie fussed at Brandon the entire trip until I handed Brandon his food from the lady at Burger King. When Chewie smelled that food. he instantly became Brandon’s best friend for the moments that it took him to eat the small piece of meat and the french fry that he shared with him. We all know that once the treat is gone they just want some more. Remembering To Change The Energy Around Your Monkey When Problems Arise Is An Important Thing To Do. Doing This Change Can Work Wonders, And Sometimes It Can Even Give You A “Special Miracle” To Be Able To Remember Forever. 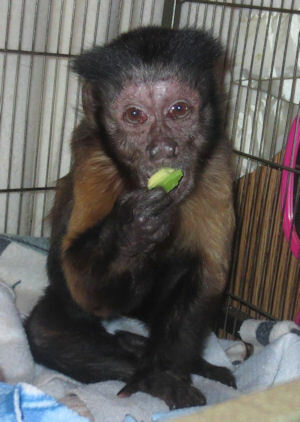 The emotional body of the monkeys must often be tended to if we are going to be good monkey caregivers. The emotional needs of our monkeys can pull them away from us or closer to us. I strongly advise to learn how to read your monkey’s energy and choose to use all of your tools that are mentioned in “Living With Monkey”The Baby Book. This book is the foundation book for the series. If you choose to order the book I know that you will be pleased to learn more about your important tools. With Chewie there have been many gentle changes as he has aged. I cannot say that I like the changes, but we must all accept the process of aging. I am so thankful to still have him with me. I understand his frustration with his body as he struggles to lift his tail or he tries to climb. 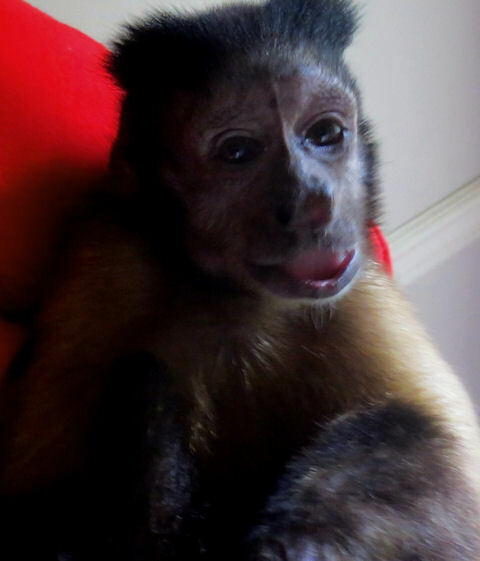 He is such a special little monkey and we are all very excited about him turning twenty years old in April 2016. I am also very thankful to still be able to have special moments with him and one of those is his bath and grooming time. Please remember to keep us in your prayers as you know his time of passing will come. I hope to be able to celebrate his life always because he has taught me so many wonderful things about living with monkeys. 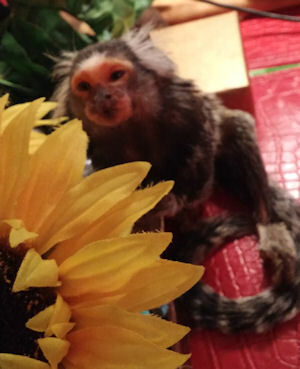 The following photo is the first photo that I received of the most recent monkeys that I chose to add to SunShine MonkeyShines. They both have become very special monkeys in my world and the world of my troop. It was not the first time that I had seen their faces as you will learn in the next story. 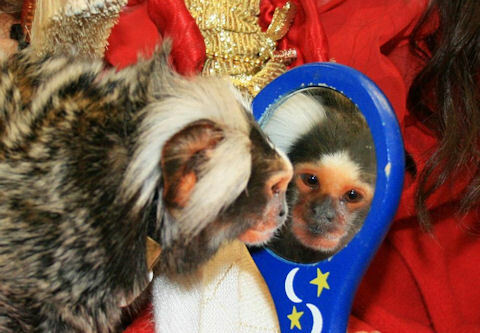 I will never forget the feelings that I had when I learned that Chee Chee and Mickey (two aging monkeys) were available to be re-homed. It was late spring in 2014 when I spoke with my friend about receiving these two monkeys. I had known them during my younger years in the early 90’s. When I met their owners they were organ grinders and were traveling in the eastern part of the country to show their troop of monkeys. As my friend and I were talking about these available monkeys, I learned that the husband of the couple had died eighteen months earlier and that the wife was dealing with extreme depression. The monkeys had been given to my friend and she had been told to find them a good home. My friend continued then began to tell me more about the pair of monkeys. Mickey, I remembered well. He had amazing eyes and was an extremely handsome monkey. As we were talking I recalled a conversation that the owner and I had spoken about when we had been together many years ago. She had told me that she thought she would never understand him and that she was thinking about letting her husband work with him. My friend told me that the owner had indeed done this and that Mickey was not good with women and that he had also been very depressed since he had lost his owner. Cheech was not as locked into my memory because she had several monkeys when I had known her in the years past so, I did not know very much about her. I listened carefully as my friend spoke and gave me the information that she knew about her. I remember trying to listen for the peaceful pathway during my decision making process. Each time I would envision them possibly living a very different type of lifestyle I instantly lost my peace. But, when I envisioned them with me in my home with my troop, I would feel more peaceful about my decision but not totally at full peace about what to do about getting them. 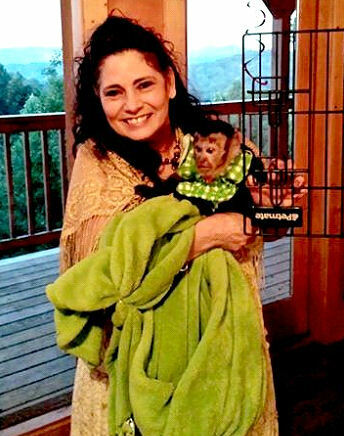 When I began to envision being in the same place as the owner was in and might have to choose to re-homing some of my monkeys, I reached my greatest feeling of peace about adding them to our lives. These monkeys had lived their lives in a troop of monkeys similar to the way my monkeys had lived. When I thought about my Maggie, Pincher or Sissy being re-homed, I could not live with one moment of thinking about them being in a home without lots of other monkeys. I knew that Cheech and Mickey were both going through many changes right now, plus they had been sharing their owners sadness and grief too. Knowing these things just made me more keen on adding them to SunShine MonkeyShines. I could not believe I was adding yet again two new monkeys but I did know that I was very excited to know it was the only peaceful solution for me to follow. As my good friend, Danny Covington and I were making our way down to the meeting place to pick up Cheech and Mickey, I was getting more and more excited! Danny had instantly offered to drive me back and forth to pick them up. With a meeting time arranged we had to remain focused on driving and not stopping so we took lots of food not only for us but for the new monks too. I will never forget seeing and hearing those two monkeys sounds as they saw my face again. Without a doubt we all knew that they had remembered me from my visits to see them years ago. I knew that Cheech was much older but Mickey seemed like he was a young vivacious monkey with his eyes flashing with excitement. It made me feel so wonderful to hear their woo-woo calls of greetings. It seemed like they knew where they were going. We loaded them into their big cages with lots of good food and water and said our goodbyes to my friends and headed back to Tennessee. Danny had instantly made friends with Mickey and I, of course, made friends instantly with Cheech as we were driving and relating to them during our trip home. 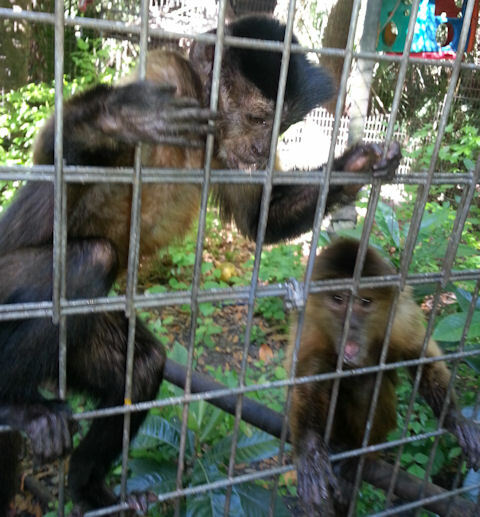 I was so happy to get the two new monkeys settled into their new sleeping cages at my home. The next morning is when I realized that Cheech had very poor eyesight and that Mickey was very fearful of my loving attention as I would open and close his cage to feed and care for him. It was very apparent to everyone that Mickey was very sad when he first came but within a few months he was settled and flourishing with his new friends Maggie Mae and Pincher. I knew that getting information about the two monkeys would be very difficult due to their previous owners deep sense of loss. She had told my friend when she had gone to pick them up from her that she did not wish to speak with anyone about the two monkeys. She just wanted them to get a good home. When my friend picked them up she had not spoken to her about their age or other information but hoped to go back and be able to speak with her about this at a later time. 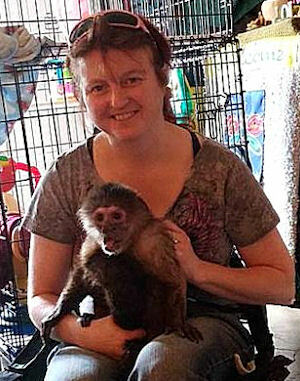 As it turned out, all information about my two new monkeys has been lost since the owner became more and more lost in her emotional struggles over loosing her husband and her lifestyle of traveling and entertaining with the monkeys. Every time my friend went to see her she was more and more withdrawn and her emotional stability was going further and further away. She passed away in September of 2015. I really wanted to know how old both of these monkeys were but that was not possible to ever know so I began tying to count the years that I had known them from my past and then come up with a general idea of their ages. I now say that Cheech is somewhere around 43 years old and Mickey is somewhere around 33 years old. Finding out as much as I can about the monkeys past has always been something that is very important to me but as time has passed it has not really mattered with Chee Chee and Mickey. They have turned out to be perfect for me and the troop in every way. They have both offered so many new experiences for us all. Maggie Mae now has two boyfriends which has made her not wish to go and do the education through entertainment programs that we do. She is just happy staying with her boys. Cheech has given me and the troop two very special gifts. She did not know that she had challenged the troop about the alpha spot in my troop but she did. Evidently, she had been her troops alpha monkey, so the other monkeys in my troop thought she was going to be alpha in their troop when she came. I remember when she came having many good laughs as Maggie Mae, my alpha of the troop, would slip around and even cower around her in the beginning and even now she does not know exactly how to be herself when they are together. Cheech could not see where I put the food or water in her cage but that did not matter at all of them. They knew that she was big and had the energy of an alpha monkey. Even after all of these months, the troop respects her and does not know or understand that she is now almost completely blind and could never take over Maggie Mae’s treasured place in our troop. I have enjoyed writing these two stories in this posting, especially as I think of the gifts that all of these monkeys have shared with not only me and the other monks in my troop but with many others too. I can say with lots of enthusiasm that Chee Chee has been a wonderful unexpected gift. She has taught me that it is okay to share a little monkey her age with her many handicaps with other people too. I was not sure how others would respond to her as she drools and needs an extreme amount of assistance when she shares herself with people. 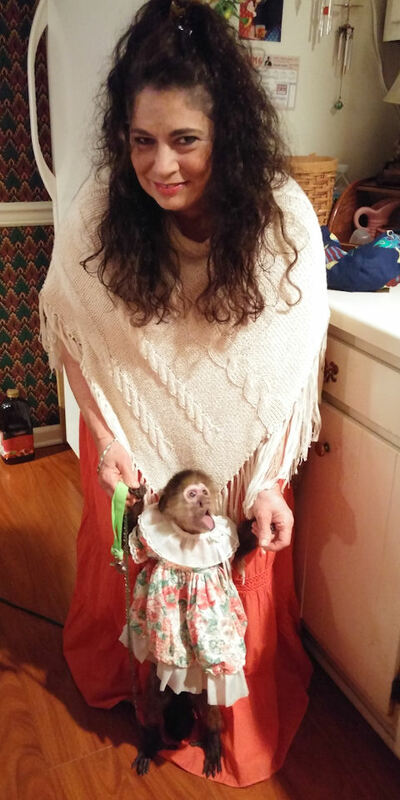 I do not pick favorites in my troop of monkeys but I can say that she makes me smile inside and out when she so lovingly sits and visits for long periods of time with people that are eager to know what it feels like to hold a real-live monkey. After doing this she always has some time left for me too! There are some challenges with an aging monkey as they loose their abilities to be normal but I can say it has just given me an opportunity to learn to be even more loving as a monkey caregiver and to learn more about what it is like to live with older monkeys. 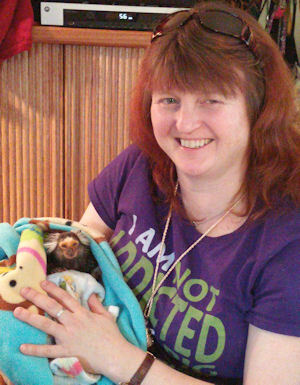 Choose to Become a Great Monkey Caregiver! Next Entry: Are you thinking about adding another monkey into your life? Next Entry Are you thinking about adding another monkey into your life?